Have you ever had a car pull up next to you at a red light that made the whole street shake? That rumble you felt deep in your gut is bass. How did they manage to turn their car into a bone-rattling personal concert? They hooked up a subwoofer to their audio system. A lot of people think bass is all about power, and that the best thing a subwoofer can do is cause small earthquakes and annoy your neighbors. However, there is a lot more that goes into a good subwoofer. They can be used to accent your audio system for a richer, fuller sound, or overpower everything so everyone within a mile radius can feel your booming bass. Whatever your specific audio needs are, this helpful guide will assist you in choosing the best subwoofer for you. 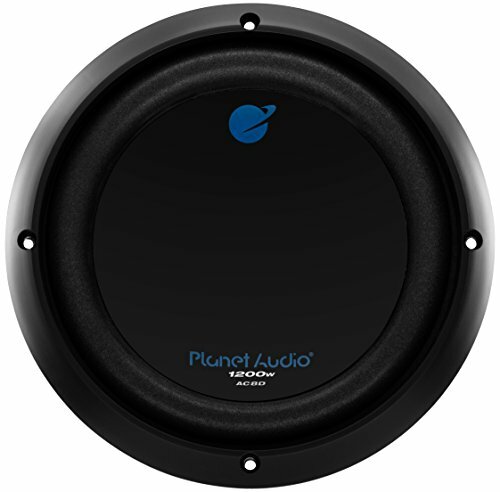 The Planet Audio AC8D 8” subwoofer is one of the best bang for your buck subwoofers out there. For the relatively low price, you get a lot of power and high quality materials. The dual voice coil allows for maximum efficiency, getting the most out of the 1,200 peak wattage. This subwoofer will stay at top performance for a long time. The sub is made of a polypropylene formula that is highly durable and can survive the massive vibrations. The advanced foam formula surrounding allows for high excursion, letting the cone move back and forth to produce more sound while staying light and easy to install. 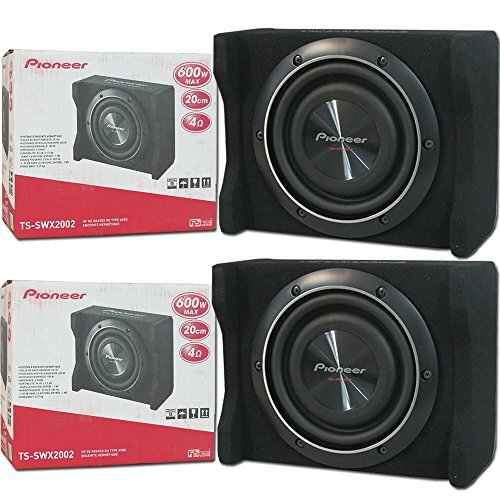 The Pioneer TS-SW2002D2 8” subwoofer is a small, easy to install sub that still packs the punch you want in your bass. The peak power is lower than some other models, but it still makes up for it with decent frequency and sensitivity, allowing for strong bass to still come through. The shallower depth makes it a breeze to install into any 8” subwoofer slot without having to worry about having enough space from the back walls. The compact size and ease of install makes it an ideal subwoofer for those who are not experts on audio installation. 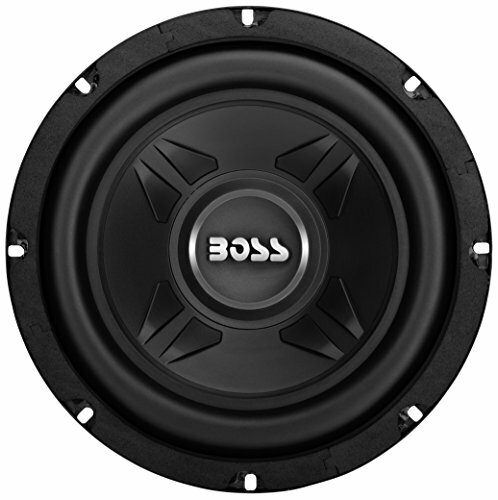 The BOSS Audio CXX8 8” subwoofer is one of the best choices if you are balling on a budget. The low price makes it a very attractive option for the wallet conscious, and the three year warranty helps eliminate any worry that you are going to end up wasting your money. The peak power level is lower than some of the other 8” subwoofers, but it still has plenty of oomph in its bass. It looks great, with an attractive metallic black finish that goes great inside any vehicle. For the low price, it really is a great option. 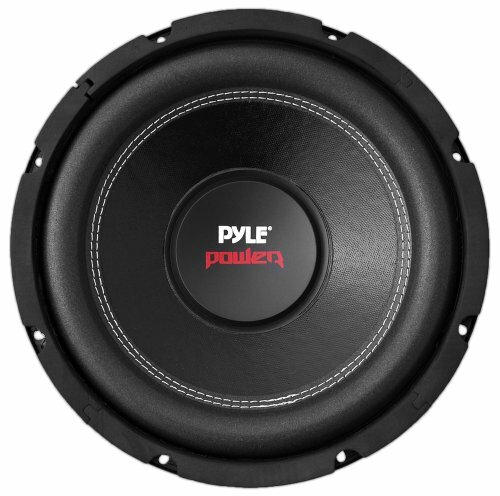 The Pyle PLPW8D 8” subwoofer has incredibly high sensitivity for a sub price this low, making it a great choice for those who are particular about their spending and their sound quality. You’ll notice that the high quality sound is even more pleasant when you remember how great of a deal it was. The Pyle has a good enough peak power level and frequency ratings to tackle nearly all of your bass needs, and the high sensitivity takes the sound to the next level. 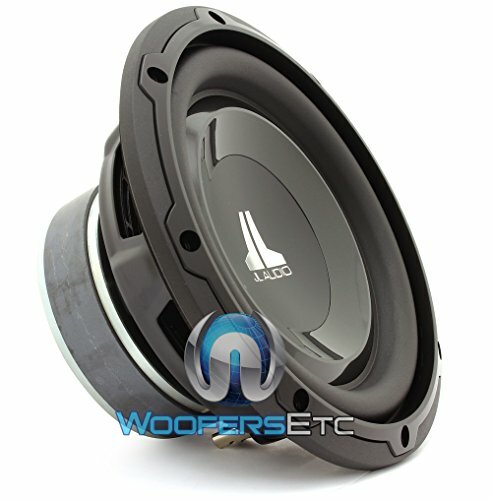 The JL Audio 8W1v3-4 8” subwoofer is a great choice for those who need an easy sub to install. It has a universal fit for easy installation in any enclosure. It is small, light, and compact, making it easy for the least handy person to still be able to install them without much difficulty. And even with the small size, you do not sacrifice for sound, as it produces great quality for its size. While pricy compared to most of the other subwoofers on the list, it is made up of quality materials that make the price worth it. The JL has the materials that can hold up against the wild bass vibrations for a long time, and its sleek design makes it great looking in every vehicle. 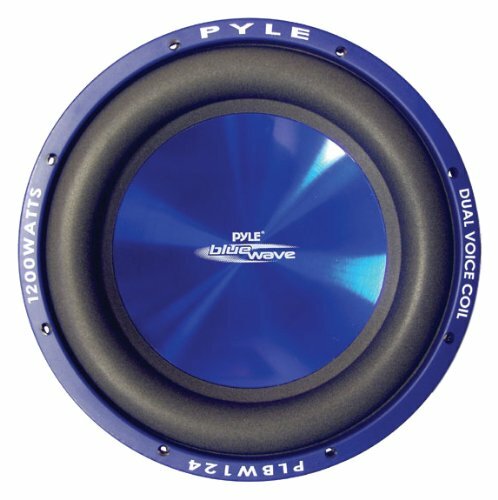 The Pyle PLBW84 Blue Wave 8” subwoofer is a great option for those shopping on a budget. The metallic blue finish is a striking look that makes it stand out from the other subwoofers that basically only feature black and silver. It has lower sensitivity and power levels than some of the other subwoofers, and they are not as durable as many of the other options. However, it still produces quality sound with a distinct look and at such a low price it is still a great option for those not trying to shell out as much money. 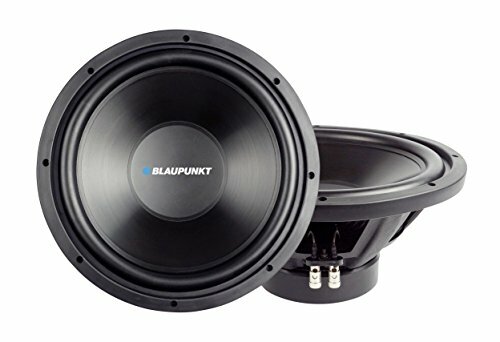 The Blaupunkt Single Voice Coil 8” subwoofer is a great cheaper option for those interested in purchasing a sub that will hold up over a long period of time. Its durable frame and foam outer prevents the strong vibrations from rattling your car more than it should. The Blaupunkt has a lower power level and limited frequency range compared to some of the other subs, but it has a high sensitivity that still allows for quality sound. 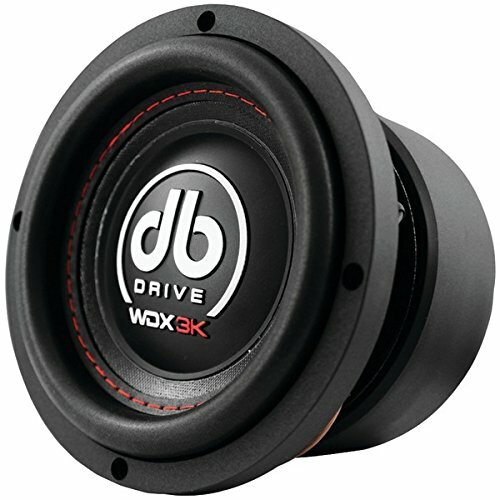 The DB DRIVE WDX8 3K 8” subwoofer is an extremely high quality sub that produces great sound without being overly expensive. The DB has a very high power level that provides booming bass, and it is designed specifically to maximize its sensitivity. The high excursion spider design helps turn this sub into one of the best when it comes down purely to sound quality. You will not be disappointed with what you hear. The Skar Audio IX-8 D4 8” subwoofer is an inexpensive yet highly effective option for those concerned with both cost and quality. The advanced cooling system keeps the sub from overheating and catching your car on fire, meaning the only thing smoking are the hot beats you are going to be playing. 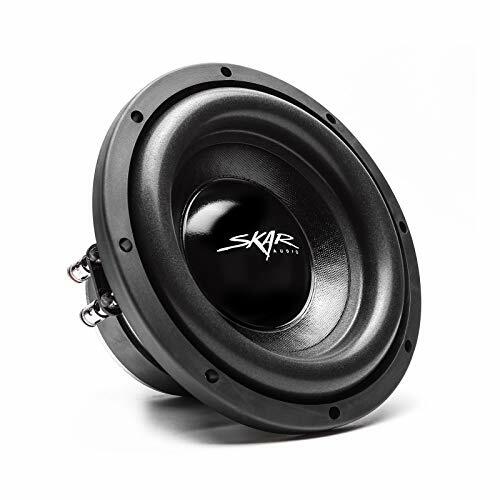 The Skar does have a lower power level compared to other subs, but its high efficiency rating helps make up for that in sound quality. Its high quality components help it stay intact no matter how hard the bass drops. 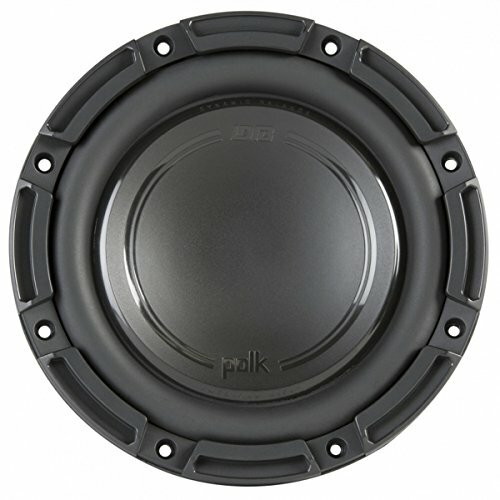 The Polk Audio DB+ 8” subwoofer is a strong choice for those who are looking for a sub that is going to last a long time. It is resistant to water, dirt, UV rays, and many other natural hazards, meaning you can go off-roading and not worry about your subs shorting out. The Polk has a compact size that allows it to fit easily into most enclosures, and its Dynamic Balance technology makes sure that the sound will hold up just as long as the sub does. There are a lot of things to consider when choosing the right 8” subwoofer, and it can get very confusing to decipher all the different technical terms. Sometimes it feels like you need an advanced physics degree just to get some extra bass in your car. So what should you be looking for in a subwoofer? The main things to pay attention to are power, sensitivity, frequency, impedance, durability, and size. Power in subwoofers is very important if you are trying to achieve that classic, earth-rattling bass. The power level refers to how much power the subwoofer can handle. The higher the power, the more bass you are going to get out of your subs. The power is measured in watts (w), and any sub with over 1,000 watt capabilities will be able to give you that powerful thump you desire. However, it is important that your sub is hooked up to an amp that can handle its power. If you have a 1,200 watt sub hooked up to a 350 watt amp, you will not be able to take your bass to those extreme levels you are looking for. That is why it is important to have an amp that has equal (or ideally greater) wattage to your subs so you can fully take advantage of your equipment. Sensitivity in subwoofers refers to how much power it needs to produce a certain volume. It is often referred to as the sound pressure level, or SPL. It is measured in decibels (db), and a good sensitivity range for subwoofers is between 85 and 100 db. A raise in just three decibels means the subwoofer needs half as much power, so what seems like just a slight change can actually make a huge difference, Subs that have high SPL values do not require as much power as those with lower SPL values. That’s why if you have an amp with a lower power level, you should make sure you get a sub with high sensitivity so you can still reach those high volumes. Frequency in subwoofers refers to the range of sounds the sub can produce. It is measured in hertz (Hz). The range of frequencies that can be heard by the human ear is 20 to 200 Hz. Anything lower will not be heard, but you will feel the vibrations. Bass is as much about feeling as it is sound, so it is important to get subwoofers that can reach the lower end of the frequency range so you can get that bass you feel in your bones. However, frequency is also greatly affected by the type of enclosure you put your subwoofer in, so your frequency numbers might not totally reflect its real world level. Impedance is the measure of electrical resistance in the subwoofer, measured in ohms (Ω). You want less resistance, so you should be looking for subs with low ohms. This allows it to run more efficiently, using the power more effectively. Durability is obviously important for anything you buy, but it is especially key for subwoofers because of how much stress all that thunderous bass puts on them. That is why it is important to make sure that the subs are made of quality materials so that they do not crack or blow right when your favorite bass drop is about to hit. It is also important to know if your subwoofer needs to be broken in. Some subs can handle the stress right away, but if yours needs to be broken in and you crank everything up to 11 right away you can ruin the expensive piece of equipment you just got, or at least shorten the lifespan significantly. Subwoofer size is important for a variety of reasons. The most obvious reason is that your subwoofer needs to fit the size available in your vehicle, otherwise it will not fit and it will be a waste of money. Installing subwoofers in your vehicle can be very difficult, so unless you are a particularly handy person who knows there way around their car, you probably want to make sure that your subwoofer is easy to install and fits well. You should also pay attention to the depth of your subs, because they need at least .75” of space from the back wall to be able to produce the right sound. Size is also important for sound. Bigger subs produce louder, more powerful bass, so if you are really trying to shake things up you should aim for bigger sizes of subwoofers. Choosing the right 8” subwoofer can be stressful, but if you follow this guide you should have no trouble choosing the best one for you. This guide has given you plenty of great examples of diverse subwoofers that will cover all your bass needs. Whether you want cheap and effective, or the highest quality no matter the cost, the sub for you is there. Whether you want booming, powerful bass, rich sound, or high efficiency, there is no wrong choice as long as it works and you are happy with the sound it produces. Different subwoofers offer different advantages in these areas, so it is all about the audio system that you are trying to create.